What’s new in 2.2 ? The first one I want to thank is KB Sriram. He wrote a wonderful homebrew program for Nook (softrooted only) called Trook, which allow the user to browse for RSS and OPDS feeds online, and download the linked content locally (to read it on the Nook). Trook is now fully compatible with calibre2opds, and users can now enjoy their complete Calibre library locally on their Nooks. KB wanted this compatibility so hard that he actually gifted me with a Nook, and that’s such a nice gesture that I want to thank him for his kindness ! Thanks KB ! The second man who comes to mind is Dave Walker, the author of the original script that actually inspired this application. Dave handles the documentation, feature requests, beta testing and is the guru of this project. He has great remarks and ideas, and spends a lot of time helping me on this project. Thanks Dave ! And, last but not least, Jane Litte and Ian Dixon have helped me with beta testing. Thanks Jane, thanks Ian ! There are three buttons at the top of the GUI that allow to choose from default, publication and Nook mode. Each of these modes sets a list of options values, and disables a few options (required for the mode to have a specific value). 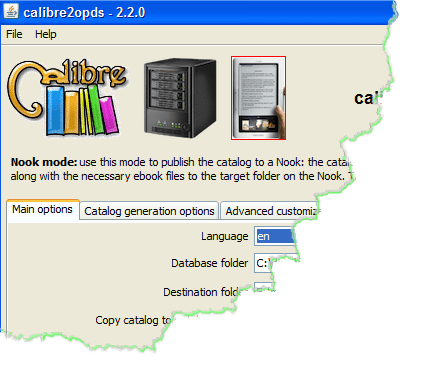 In the default mode, calibre2opds works as it always had, to the exception that the catalog is generated in a temporary folder, and then moved to the Calibre library folder. 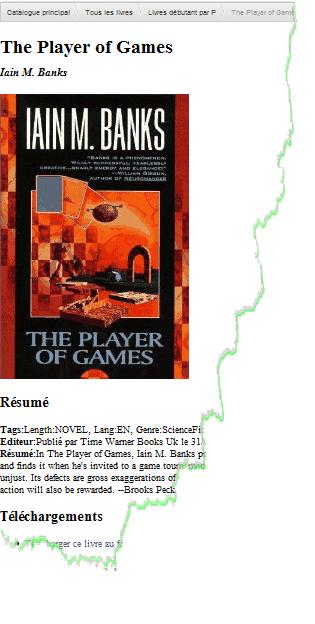 In publication mode, the catalog is not moved to the Calibre library folder, but to another folder (called the target folder), to which the relevant files from the Calibre library are also copied (all referenced books, and their covers). In Nook mode, the same is done but the destination folder is assumed to be the “My Documents” folder of a Nook’s internal SD-card. This mode generates a Trook-compatible catalog. 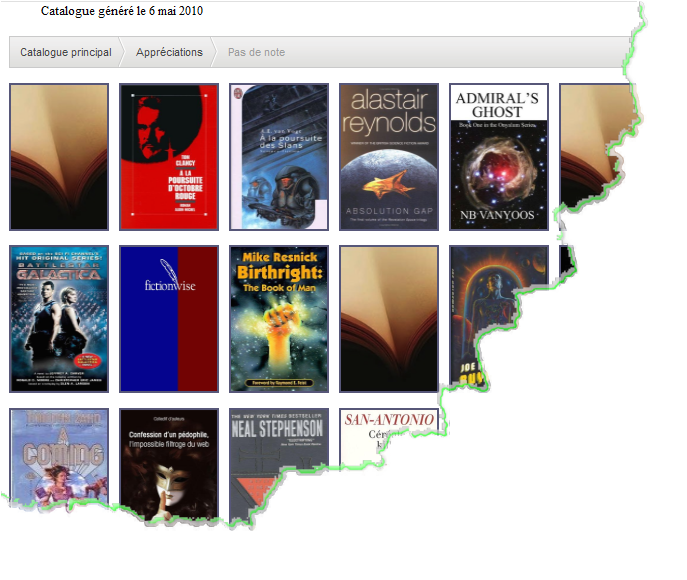 Trook then can access all of the user’s books from the now local Calibre library. The configuration system now has a version chip written in the configuration file, which serves to check for compatibility between a newly installed version and an existing configuration file. In case of incompatibility, a warning is issued and the configuration is reset. This will be the case for this first release, so be warned ! OPDS being a draft standard, it has evolved. I changed the generated catalogs to be compatible with the latest (at the time of this writing) version of the draft. There is now an option to generate cover-only books lists in the HTML catalogs. Not only do they look good, but they are easier to use on small touchscreens.